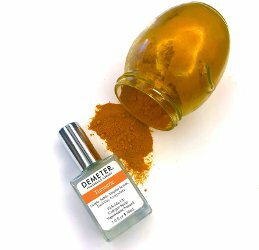 Demeter has launched Turmeric, the latest addition to their Fragrance Library. Light and slightly aromatic, with notes of Ginger and Orange, this is as transparent as a spice scent can get. Turmeric has been used as a bright yellow dye, and in cooking for hundreds of years, mostly to add color to sauces and curries. More recently, it is touted for its health benefits. But only Demeter is focused on the lovely scent profile Turmeric provides. Demeter Turmeric is available in 15, 30 or 120 ml Cologne and in matching bath and home products ($6 - $40).